LEN - www.lankaenews.com | Not enough the Rajapakses’ pillaging – Basil ‘s wife too collects Rs. 20 million from another Chinese Co. ! 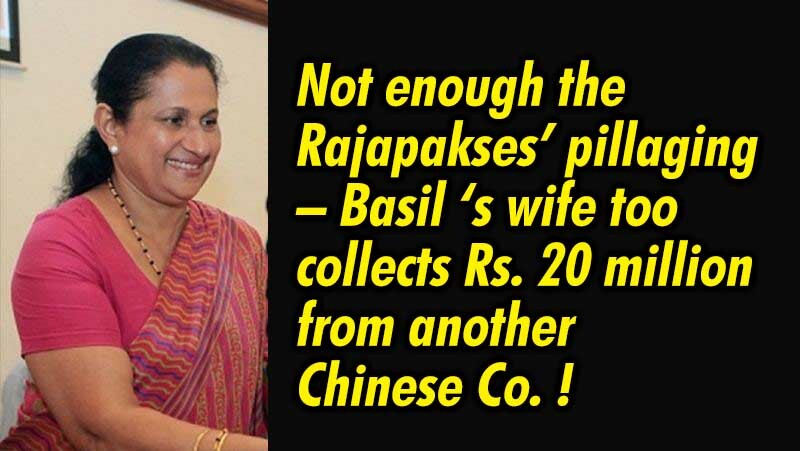 Not enough the Rajapakses’ pillaging – Basil ‘s wife too collects Rs. 20 million from another Chinese Co. ! (Lanka e News -06.July.2018, 11.30PM) Pushpa Rajapakse the wife of ex minister Basil Rajapakse had received a whopping sum of Rs. 19,410, 000.00 supposedly as aid for the foundation run by her from the Chinese Co.( CICT) that undertook to build the Southern harbor. However now it is reported that this colossal sum was not given as a gift but rather it is part of the expenditure to meet the cost of the construction of the Southern Port. According to the Government Audit query POS/A/SLPA/2016/4 dated 2016 -03-01 , this huge payment to the voluntary organization of Mrs. Basil Rajapakse has been included as part of the expenditure for the construction of the southern port development by Container International Terminal Co.Ltd. Colombo which is the Chinese Co. that had undertaken to construct the Southern harbor. The CICT Co. has commenced its operations as regards the Southern Port Container Terminal operation development on 2013 -07-13 on a 35 years re -payment program . While headway was being made in this connection , on 2012 -05 21, the colossal payment of Rs. 19,410,000.00 had been made to Pushpa Rajapakse’s voluntary organization. CICT Co. has made this disbursement by Hong Kong and Shanghai Bank check No. 594691, and that sum had been credited to account No. 204 - 1 - 001 – 0003290 at Peoples bank headquarters .The Government Audit has confirmed that the sum had been credited to that account. When the Ports Authority Financial director’s audit made inquiries into this and from the CICT Co. chief executive director/officer , it had been confirmed the payment was made to the voluntary organization aforementioned , and it was further confirmed based on the accounts records that it is part of the expenditure towards the Port construction. Yet it has come to light this payment has been made to Pushpa Rajapakse Foundation by the Chinese Co. at a request made by the Ports Authority. An intermediary who came in at the time of signing the ports development agreement between the Co. and the Ports Authority had released this massive sum to the voluntary organization. In the circumstances the Govt. Audit had inquired in its Audit query , when there are so many voluntary organizations in this country , why so much money was credited to this organization and based on what motive ? In addition , under section 62/8 and sub section of the CICT contractual agreement ,after the end of 35 years when the contract is over, the government (Ports Authority) has to re pay the CICT Co ., the latter’s expenditure towards the bogus property and the Container Terminals development together with the book value owed to the operator . Therefore the government audit has pointed out with deep regret this colossal sum collected from the Chinese Co.for the voluntary organization of Pushpa Rajapakse out of the funds meant for the Southern Port development is absolutely wrong and most reprehensible.